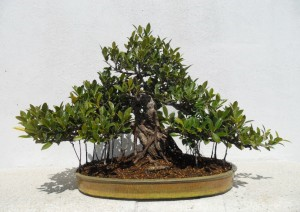 In the autumn of 2011, David Cortizas asked me to make a pot for one of his many Ficus bonsai. David wanted a shallow 46cm wide oval with a yellow glaze, however, he didn’t want just a straight forward yellow. He showed me a very old yellow Japanese pot with a lot of patina and asked if I could possibly give the glaze a similar appearance, the look of “Old gold “as David put it. I wasn’t 100% sure that I could reproduce the antique appearance, as the patina on the pot that he showed me had probably taken decades, if not centuries, to accrue, but I was willing to try! For sometime now I have been experimenting with different formulas to apply to a pot after it has been fired, to give the glaze a patina / antique appearance, so now was a good time to put the formula to the test. I combined a yellow and orange glaze both of which were semi gloss. These colours would mix during firing to produce the orangey yellow colour that I needed. 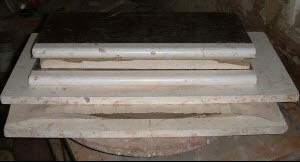 However, although the gloss would craze or crackle nicely which would help towards the antique appearance, it would not create the aged patina required without some help. So to give the glaze a more porous surface, which it would need to hold the patina, i also applied a third matt glaze that was a shade of yellow / pale brown ochre. 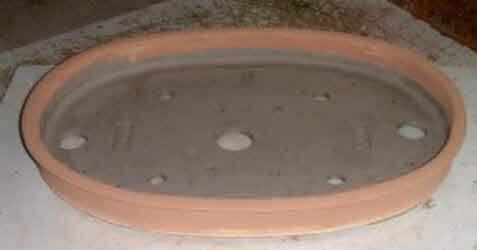 The pot was then fired over two days in an electric kiln to 1260c, after this the kiln was allowed to cool slowly for 5 days. After the pot was fired I applied the mixture that i have formulated to give the glaze the antique patina and both David and I were very pleased with the results. 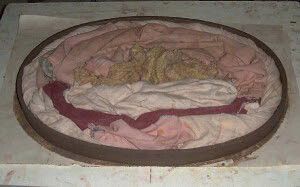 The raw pot filled with rags to support the side walls while I turn it over to let harden slightly. 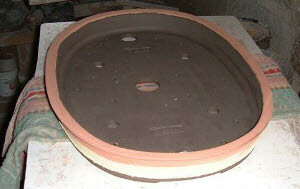 The raw, unfired bonsai pot with boards on top of it to keep it flat while it hardens slightly at room temperature. 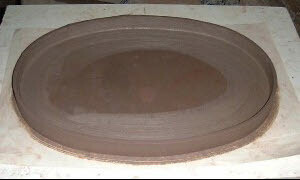 This process greatly reduces the possibility of the pot warping when it is being fired. 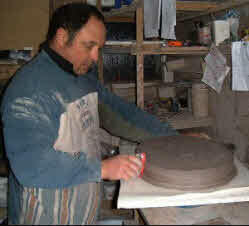 Detail being added to the pot and as well as the feet being put on. The Bonsai Pot As It Dried Out And Was Glazed. 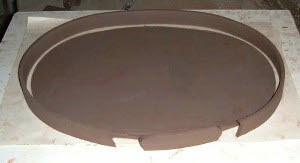 The bonsai pot after it had been fired in the kiln for 7 days. Finally, David Cortizas’ ficus bonsai planted into it’s new pot.